Michael is an experienced business litigator and a trusted advisor to the Firm’s clients. Clients rely on Michael to handle a wide variety of litigation matters, including those involving commercial contracts, federal and state statutory claims, and breach of fiduciary duty. 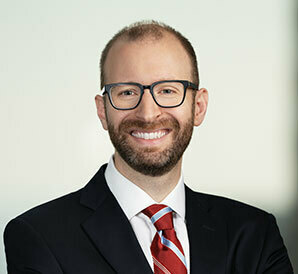 In addition to his litigation practice, Michael also counsels and advises motor vehicle manufacturers regarding dealer relationships and programs. Michael’s experience covers the entire litigation process, including discovery, depositions, motion practice, settlement negotiation and mediation, summary judgment, witness preparation, evidentiary hearings and trials, and appeals. He has leveraged this experience to achieve significant results for the Firm’s clients. Courtroom Experience. Michael has presented opening and closing arguments, taken direct and cross-examination, prepared witnesses, and argued motions. He has appeared before state and federal courts, as well as administrative agencies and arbitration panels. In a FINRA arbitration between financial institutions, Michael took direct examination of two key witnesses and cross-examined the opposing party’s CFO. The arbitration panel denied the opposing party’s central claim, which sought over $1 million in damages. Chicago Patrolmen’s Federal Credit Union v. Cambridge Investment Research, Inc. et al., FINRA No. 14-03103. Michael made opening and closing arguments and took examination of seven witnesses in a pro bono matter, resulting in a favorable outcome for the client. Briefing. Michael has extensive experience researching and writing briefs and other persuasive documents. Michael drafted a summary judgment motion on behalf of a telecommunications company in its lawsuit against a city. The city had violated federal telecommunications law in denying a construction permit for a cell tower. In response to the motion, the city conceded that summary judgment should be granted against it. Eco-Site, Inc. v. City of Harvey, Case No. 1:15-cv-11535 (N.D. Ill. closed July 29, 2016). On behalf of a luxury goods manufacturer, Michael drafted a motion to compel a dispute to arbitration in a foreign country as required under international law. After the motion was briefed, the parties reached an out-of-court settlement. Discovery & Depositions. Michael has guided numerous clients through the discovery process, including document preservation and collection, responding to discovery requests, and identifying cost-effective strategies for document review (including technology-assisted review). He also has taken and defended several depositions. Mediation & Settlement. Michael has participated in court-ordered and voluntary mediations and has assisted in negotiating, structuring, and drafting settlement agreements. He also has conducted internal case evaluations to determine the value of a case for settlement purposes. One such evaluation involved the informal analysis of large amounts of client data, resulting in the successful settlement of a class action matter for a reasonable sum without the need for hiring an expert. Serving as the primary point of contact for dealer communications for one third of the nation. Coordinating with business people and in-house counsel to address questions or concerns raised by dealers. Coordinating a nationwide campaign to issue the new agreements to the dealers in accordance with the laws of each of the 50 states. Training business people to discuss the new agreements. Drafting and implementing a complex settlement covering over twenty dealers that filed litigation opposing the new agreements. Juvenile Resentencing. Michael represented a prisoner who, as a juvenile, had received a mandatory life sentence without the possibility of parole. A change in the law gave the prisoner the right to a new sentencing hearing, which involved complex legal issues and extensive factual investigation. Prior to the hearing, Michael submitted briefing on key factual and legal issues. At the hearing, Michael gave opening and closing arguments, took direct examination of six witnesses, and cross-examined one witness. The judge rejected the prosecution’s argument that the prisoner should be re-sentenced to life without parole and reduced the sentence to a term of years. Political Asylum. Michael was part of a team of attorneys that successfully obtained asylum for a Zimbabwean refugee. Michael worked closely with an expert witness, whom he prepared to testify. He also performed extensive investigative work, which became part of a detailed pre-hearing record. At the hearing, the immigration judge remarked that the pre-hearing record was perhaps the most extensive and persuasive the judge had ever seen, and granted asylum after hearing only minimal testimony.